Indian captain Virat Kohli had no right to strut, but strut he did. 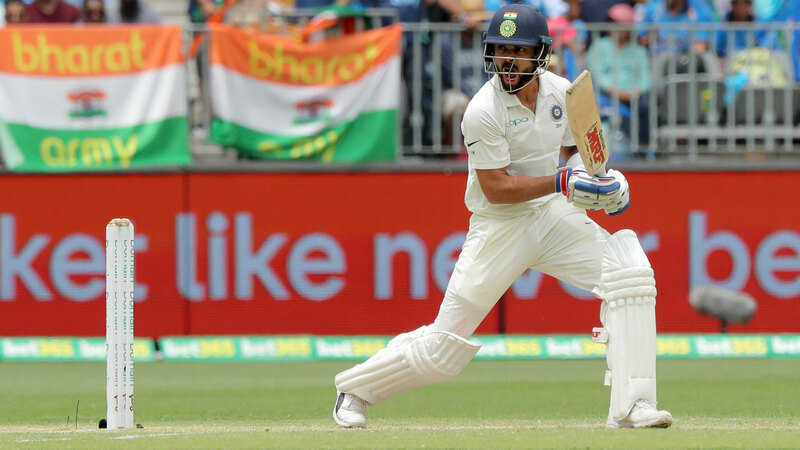 Kohli simply oozed confidence as he strode to the crease on Saturday to front up to Australia's menacing pace attack at Perth Stadium. Judging by body language, you would have thought India were 2-300 and in control of the second Test. Instead, the visitors were reeling at 2-8 after Murali Vijay and KL Rahul had their castles rocked by stunning deliveries from Mitchell Starc and Josh Hazlewood respectively. Kohli didn't let the situation faze him, playing some glorious strokes early to get the scoreboard ticking over. He scored 19 off his first 12 balls to break the stifling pressure Australia had applied. Kohli's innings was by no means perfect. On 22, he shouldered arms to a big-spinning Nathan Lyon delivery that only just missed his stumps. There was also a series of plays and misses against Australia's pace attack. Kohli was unbeaten on 50 as India moved to 3-112, but he didn't impress everyone on Saturday. Indian great Sunil Gavaskar strongly criticised Kohli'a captaincy during the morning session. Gavasker was astonished that Kohli turned to Ishant Sharma and Mohammed Shami to open the bowling on Saturday instead of Jasprit Bumrah, who had been his team's most-dangerous weapon on day one. Australia, who started the day six wickets down, were able to add some valuable runs before Bumrah was introduced in the ninth over of the day. "Astonished, baffled, not just surprised," Gavaskar told Sony Sport of the decision. "Baffled because the ball he bowled to Paine with the second new ball towards the end of yesterday's play - pitching on a length, beating Paine and going over wicketkeeper Pant's head when somebody is bowling that way - why would you not give him the ball straight away at the start of the day's play? "He's been your best bowler on this surface. Yes, there might have been others who would have got more wickets to show but you know who's the man more likely to get you the wicket of Tim Paine in the morning."